January is all about new starts, promises of higher productivity and taking out gym memberships that you may or may not ever use. It can also be about unleashing a new creative side of yourself and discovering a passion that you never knew you had. If you’re tired of the same old arts and crafts and yoga classes, there are plenty of weird and wonderful workshops across London that will help make you an expert in an obscure and unconventional hobby. From decorating the inside of terrariums to suspending yourself in the air, there’s something to suit every pang of curiosity. You’ve tried yoga on the mat, now try it in the air. As well as looking beautiful and dramatic, aerial yoga offers many benefits for the body. Suspended from the air in a sling, it allows you to access difficult yoga postures more easily as well as improve posture, back pain, increase circulation and strengthen your core, amongst many other benefits. Combining creativity and fitness, it’s a great way to keep your exercise routine fresh in 2017. There are classes in East London starting at £10 per session, find out more here. 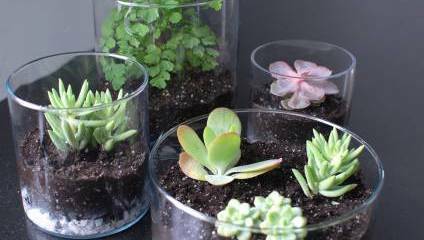 Terrariums are a big interior décor trend at the moment, and rather than splashing the cash for a pre-made one why not experience how enjoyable it is to lovingly hand make one? Learn how to make a garden in a jar to either brighten up your own home or make a perfect gift for a friend. If you’re a plant lover but flower arranging or gardening doesn’t appeal, this is the ideal low-maintenance class to create your own mini garden. This class in Camberwell is holding a workshop on 11 February, find out more here. Taxidermy certainly isn’t for everyone, but it’s undoubtedly one of the weirdest and oddly engrossing hobbies to get involved with. Adorning the walls of pubs and stately homes, preserving animals is undoubtedly a significant part of our culture. Taking a class is a great way of learning more about the anatomy of animals as well as unleashing your creative side in a completely different way. The British Academy of Taxidermy run regular classes working on everything from bird wings to raccoons, find out more here. A linocut is a printmaking technique that involves carving a print onto linoleum mounted on to wood. Once you get the hang of it you can create all sorts of detailed and vivid creations that will make a refreshing change from the white canvas. It’s certainly an obscure form of creating your own art, but there are special one-off classes dotted throughout the year, including one in March at the Art Academy in London, find out more here. There’s more to circuses these days than clowns, balloons and slapstick. Learn about the incredible acrobatic feats of tightrope walkers and aerialists at the National Centre of Circus Arts, tucked away in Hoxton. If you’ve ever seen professionals at work the idea of a class may sound daunting, but there are plenty of beginner’s classes at the centre, whether you want to soar through the air with flying trapeze, take on the tightwire or simply improve your fitness with light circus techniques. If you’re a thrillseeker, circus classes are an entertaining and challenging way to keep fit and keep things interesting. Find out more about classes here.